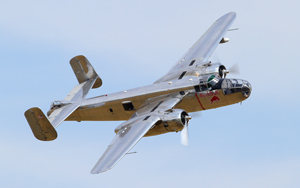 Once again we reach July and this is always a busy month for airshow goers. This year see’s Farnborough international airshow messing up the calendar again. 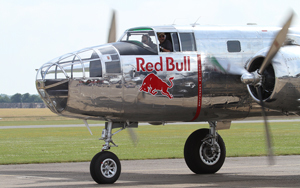 With Flying Legends and RIAT at Fairford having to be held on the same weekend due to Farnborough taking the normal Air Tattoo weekend, It was a difficult decision for many on which to go to. 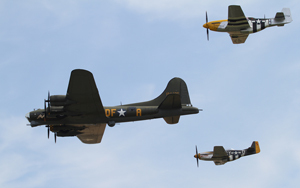 For myself, Flying Legends will always take precedence over RIAT because my passion is for WW2 Warbirds. That said, I did attend RIAT arrivals on Wednesday to Friday so did catch the ‘Stars’ Arriving. 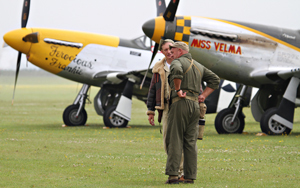 Flying Legends this year had a couple of real gems on their participation list. 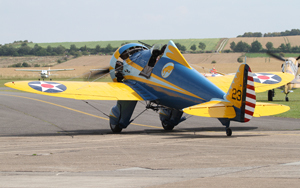 TFC had managed to bring Planes Of Fame museums P-26 Peashooter from the States. Another gem was their very own P-40C, also from Stateside, for its Legends debut. Looking at the final list a day before the show, I couldn’t wait for show day itself. Saturday’s weather was looking very ominous. At 7am, Duxford was completely socked in by a misty fog. At that point, I wasn’t even sure there would be a show!!. The flight line walk is a real highlight for Duxford shows. The chance to get that bit closer to the machines on the ground. For Legends, Re-enactors take their places in front of many of the aircraft to give that extra ‘bit’ to the photographs. Luckily the weather had taken a strange turn and the sun was starting to shine. With that came humidity and a real heat. In the ‘Vintage village’, there was plenty to do. Laurel and Hardy look-alikes gave a comedy side, The Manhattan Dolls, All the way from New York sang the sounds of the Forties. There was even the chance to ‘Sit in a Spit’ and have your picture taken. Large scale R/C aircraft were also on show for the first time this year. Unfortunately, the news started to filter that due to the horrid weather all across Europe, we were losing some fine acts. 2 Junkers JU-52’s were unable to complete the journey, Max Alpha’s Spitfire and Corsair were also out. 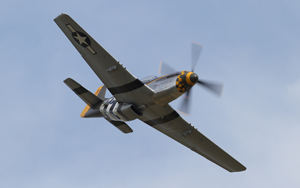 Red Bull’s Corsair and P-38 were stuck in Switzerland. Charlie’s Heavies TBM Avenger, a star of last year also succumbed to the weather. There were a few others too, and the ironic thing was, the weather in the UK was now glorious sunshine!!! The cancellations did little to deter the crowds from settling to which proved to be, not a classic legends, but a very enjoyable one. 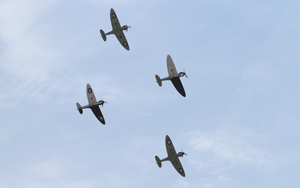 After all….where else but Duxford will you see 11 Spitfire’s flying together!! 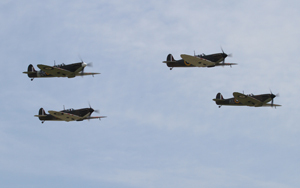 To kick off the Display, eleven Spitfires, in varying marks took off and formatted over the back of the airfield. Four MK1’s led the group in before splitting into 3 sections. 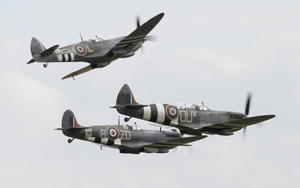 The sight and sound of the four early Spitfire’s was amazing. It did look as if one of them was having a little trouble keeping in with the formation and I later heard it was a possible throttle problem. 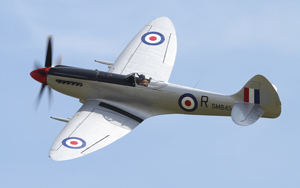 With the MK1’s on the ground Spitfire FR.XVIII led the way in a spectacular tail chase. 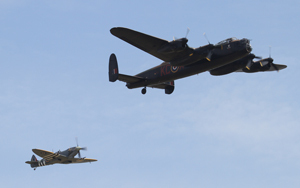 A short display by BBMF’s Lancaster and Spitfire yielded some very nice passes and was followed by 3 Piper Cubs, swooping across the airfield. Another real highlight for myself was the return to the air of TFC’s Hellcat. 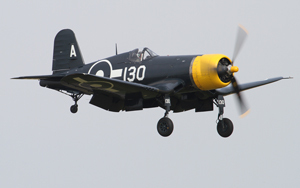 She flew in formation with their Wildcat and Bearcat plus the Corsair. 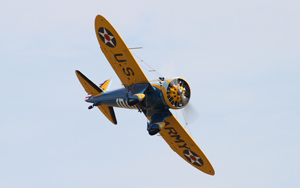 With the Bearcat’s solo finished, the Planes of Fame P-26 took to the air. What a strange little aircraft. 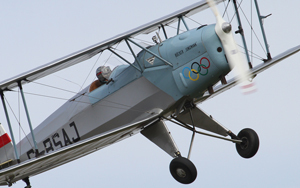 It first flew in January 1934 and finished service with the USAAC in 1938. 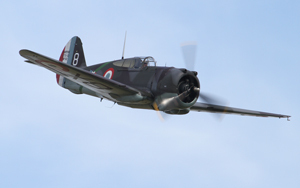 The display was a little far away but it was great to see such an interesting aircraft over Duxford. 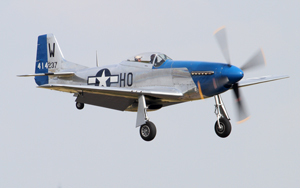 The Fighter Collection’s trio of Hawks took off and this brought us the second aircraft to arrive from the USA. 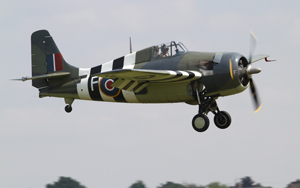 TFC’s bare metal P-40C has been eagerly awaited since news broke last year. The engineer’s did a superb job of getting it into the air after it’s delivery via crate. Unfortunately its display was cut short with a technical issue, as was their P-40F, which landed almost immediately with I believe, a pitch motor failure. This left the Hawk 75 to finish on a solo. 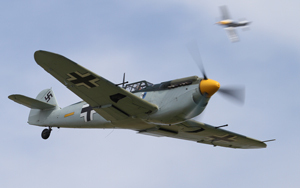 It was nice to see the two Messerscmitt ‘Buchons’ get bounced by P-51’s rather than the normal Spitfire. 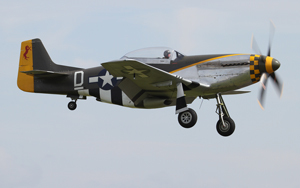 John Romain and Cliff Spink shot across the airfield in a tight formation as Mustang’s, ‘Miss Velma’ and ‘Ferocious Frankie’ bounced them. A great tailchase ensued!! 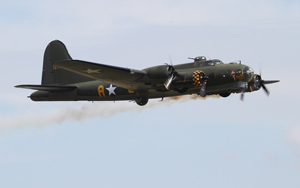 Resident B-17 Sally B flew ever gracefully and a return of the ‘little friends’ formation (missing from shows for a while) was very well received. As she flew past the Manhattan Doll’s sung the forties song ‘Sentimental Journey’ and this is becoming a tradition at Flying Legends displays. A spirited display by what should have been a trio of Red Bull aircraft but instead was a solo by their B-25 Mitchell was next. The bare metal finish looked awesome against the strong blue sky. 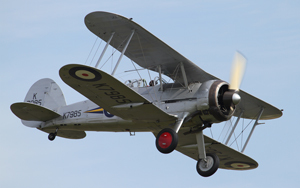 I felt the 2 Gloster Gladiators next were a little disjointed. I assumed it would be a pairs display but they displayed on their own. That said, Nick Grey in the TFC Gladiator is really setting a high standard. For the second year I would say he was my favourite display of the day. I never realised you could ring some much out of the good old Gladiator. 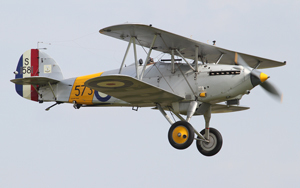 The Fighter Collection’s Hawker Nimrod followed with a solo display. At this point the crowd were delighted to see two aircraft had made it across from France late on in the day. 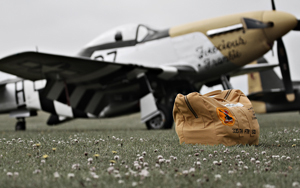 Jan Roozen’s Hurricane IIa and P-51 ‘Moonbeam McSwine’. landed promptly and the show continued. 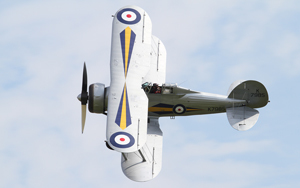 Displays by Anna Walker in her Bucker Jungmann and Chris Gotke in the RNHF Sea Fury T.20 were leading up to the third of the ‘Stars’ of the show. 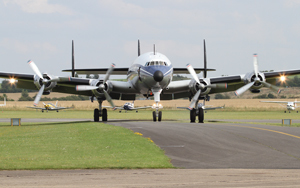 Breitling’s C121c Super Constellation is rarely seen in the UK. 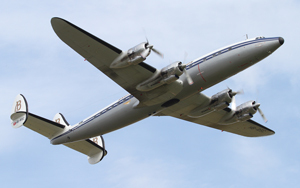 Not only had she made it to Legends, she put on a graceful display showing the classic lines of the early airliner. Dakota Norways DC3 continued the Douglas theme with an impressive flight and Nick Grey once again took to the skies to fill the ‘Joker’ Position left by the retirement of his father and TFC boss, Stephen Grey. Again Nick’s mount was the Gladiator although Sundays slot, he used the Hellcat.